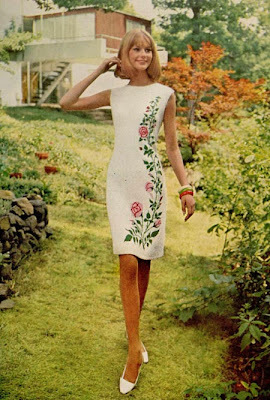 This slim knit dress is a pretty (and slightly kitsch) vintage design that's right up my alley. 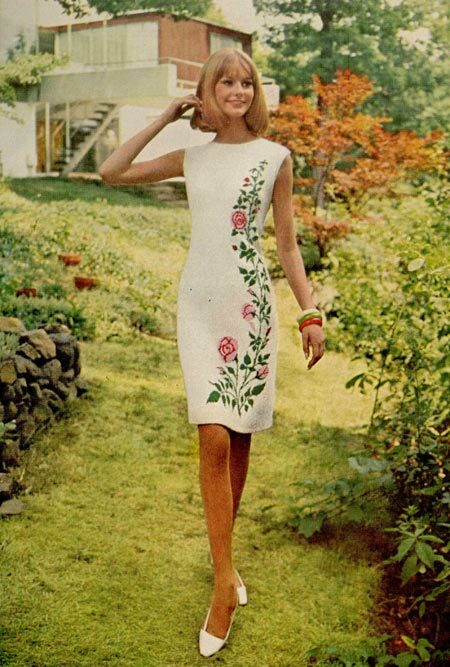 Its beautiful meandering florals were called the "rambler rose", a popular knitwear motif in the late 60s. The leggy model was featured in a vintage knitting article that showcased knitwear patterns for the home crafter. I'd love this knitted up in soft cashmere, or (ooh!) fluffy angora. Shoes from Pappagallo - Jewelry from Kenneth Jay Lane - Chic from 1967! Source: McCall's Needlework & Crafts Spring-Summer 1967.